The German Field Marshall, Helmuth Karl Bernhard Graf von Moltke, or “Moltke the Elder” to his mates, was attributed with the following quote: “no plan survives contact with the enemy”. This quote is so appropriate when applied to all of the systems (water, firewood, solar etc.) at the farm here. No systems at the farm have actually completely failed, it is just that in the real world none of them actually work like you’d think that they would when you set them up in the first place. A good example of this sort of failure is that person could read all about firewood, however nothing quite prepares you for the realities of harvesting, storing and then using the stuff. Firewood is used here to: dry clothes during winter; cook food; heat the house; provide hot water (when the sun isn’t shining); as part of the fermentation process; allowing small dogs to slowly cook their brains; and assisting with germinating seedlings. As you can see firewood has multiple uses and it is a crucial resource. However, there are so many different opinions about firewood around these parts that it is hard to know what to do and where the truth lies. Some locals advised me that the local trees are rubbish for firewood. The council advised me that it would be better to truck firewood in from the endangered River Red Gum forests up north, where some of those trees can be up to 600 years old and are very slow growing. 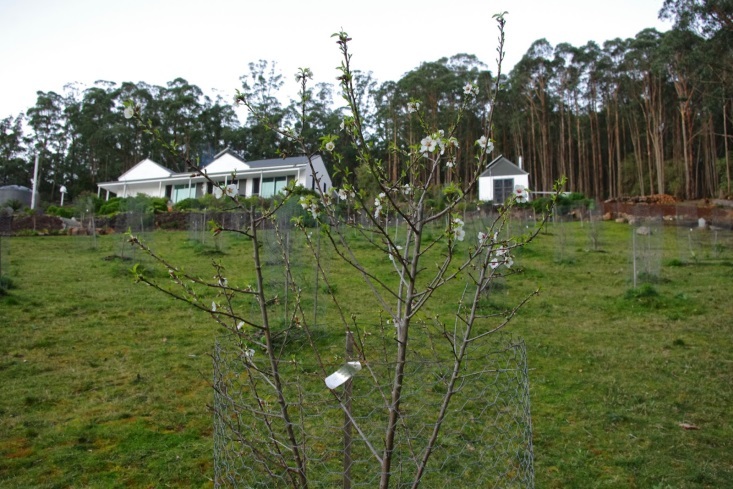 Yet on the farm here, there are tens of thousands of trees and they can grow at a rate of 1 metre (3 feet 3 inches) per year and often much more in a wet year. A years worth of firewood can be sourced from as little as four trees. It is always cheaper and more efficient to use a local resource so over the past four years I have been learning to live with the local firewood as a fuel source. This has meant confronting the realities of the fuel source and adapting the systems here based on what was observed and learnt. Every year I have had to change some aspect of the firewood systems.  In this corner of the world, there were some eucalyptus species which were able to be burnt green. Green refers to the fact that a tree could be felled, cut and split into firewood logs and then burnt straight away. The pioneers felled these species in preference to all others and burnt them. Those species are now gone and are remembered only in historical accounts.  So, in order to utilise the remaining eucalyptus species for firewood, firewood logs have to be stored for at least two years. This process is called seasoning the firewood and it allows time to reduce both the sugars and moisture content of the logs. It is those two factors which prevent the timber from burning in the first place. It is the trees natural defence against bushfires. Interestingly too, it seems to make little difference if those firewood logs are left out in the rain during this lengthy process.  For a few months prior to burning the firewood logs, they should be kept out of the rain so that they are completely dry. Dry old firewood burns more efficiently and hotter, producing less smoke and using far less logs.  If you want to utilise firewood sourced from your own trees here, you have to plan and act many years in advance. That’s all very interesting, but what has it got to do with this week’s blog? 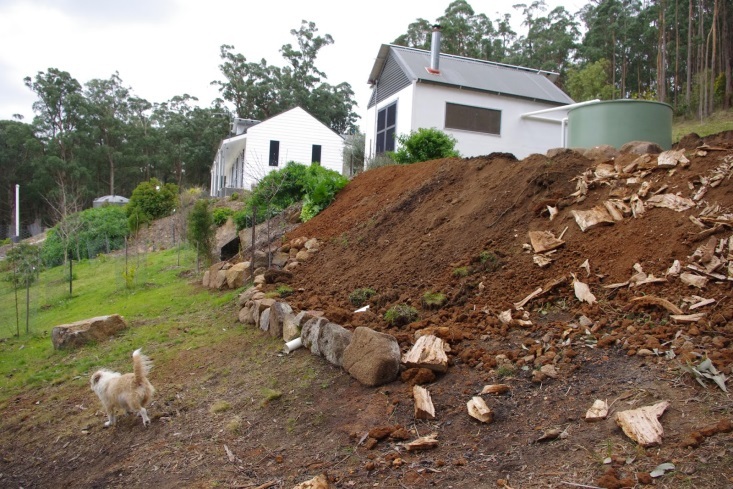 Over the past few weeks, I’ve mentioned that the farm is on the side of a mountain range and I’ve been excavating a flat site to install a new water tank. Well, that flat site will now include a small shed for firewood storage. The reason for this is that I’ve come to the conclusion that there is not enough storage here for firewood that is out of the rain. With the excavations, this week was something of a break through! The break through came towards the end of the excavations a few days ago when a path had been completely dug out behind the existing water tank. A breakthrough in the excavations. A new path has been forged. The excavations have been an interesting project because when I started it, I only had a vague idea of what I what I was trying to achieve. 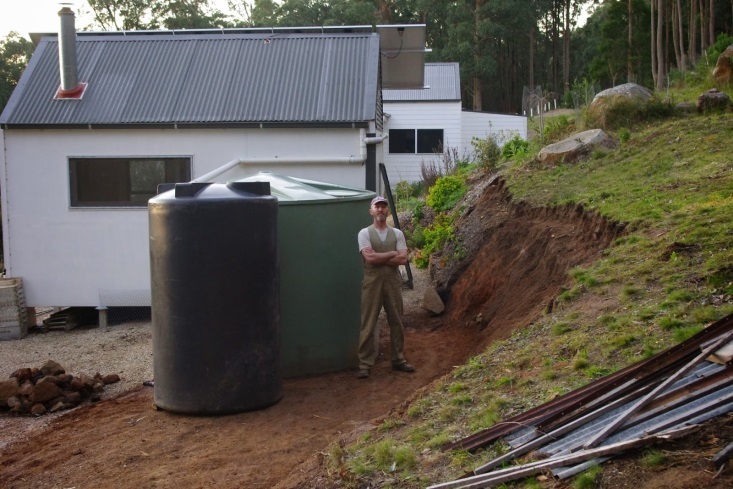 I knew that I wanted more water storage capacity, a second pump and a shed for storing firewood. However, once I started digging and moving clay – by hand – ideas began to form and the initial plans were quietly ditched. It takes a lot of time to come up with those ideas as to how all of the different systems will be arranged. Comprises are always part of these sorts of projects and cost is always a consideration. With this project: I’ve reduced the number of new water tanks from two to one; I’ve worked out a way to reduce the small off grid solar electric systems from two to one; two smaller sheds will replace the single larger shed; and the layout of the water tanks has changed so that they are more accessible and do not have soil placing pressure on the walls of those tanks (the soil pressure can potentially tip the tank over). In other farm news, the blackberry enclosure is continuing and a few new posts have been installed. The recycled steel gate has now been correctly installed and a simple latch mechanism keeps the gate shut when required. 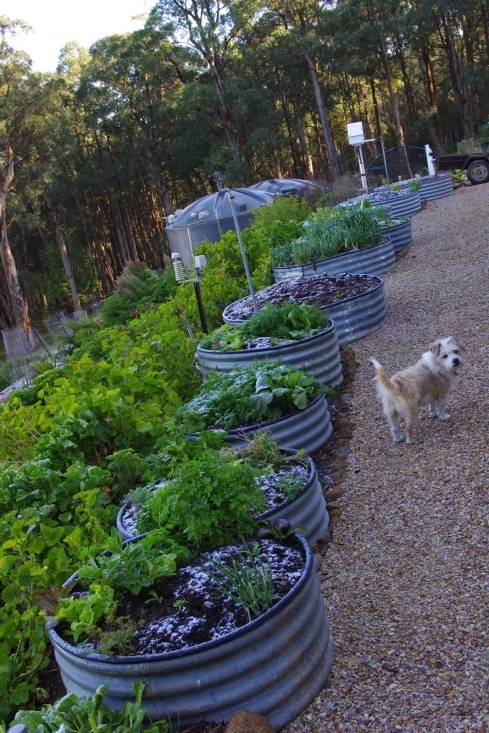 I’m really interested to see how this fencing system works because I recently caught Stumpy the wallaby sitting on top of a raised garden bed eating all of the vegetables, whilst squashing those that weren’t eaten. 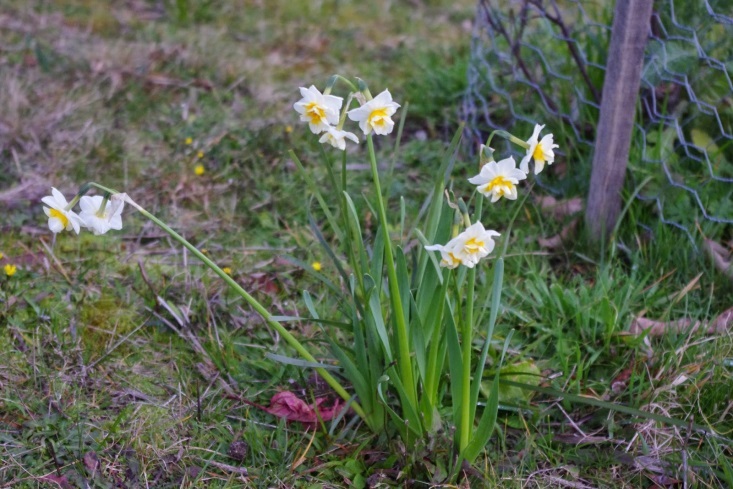 This week has been mostly sunny and the first of many daffodil flowers bloomed. 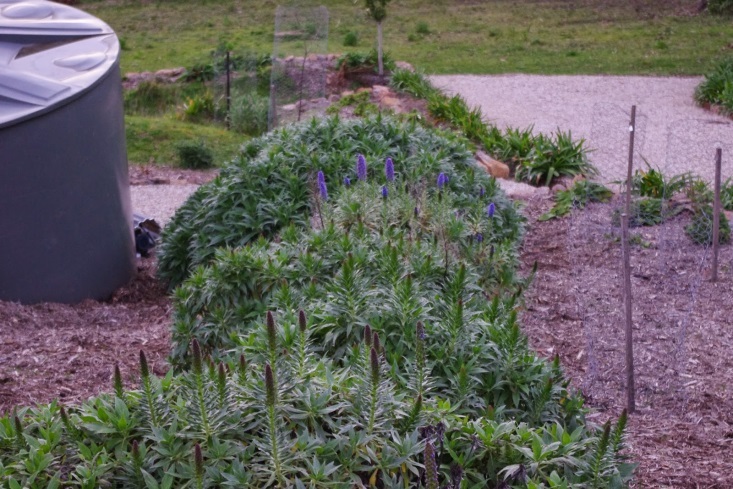 Also the echium plants have begun their long flowering cycle. The bees here love the echium flowers, whilst the smaller birds hide during the day in their dense foliage. The farm is in a thick cloud right now and it has been raining for most of the day. The temperature outside here at about 7pm is 7.5 degrees Celsius (45.5 F) and so far this year there has been 554.8mm (21.8 inches) of rainfall which is up from last week’s total of 542.2mm (21.3 inches). Some weeks here, life will throw mysteries at you. I’m sure it is some sort of test, well, maybe it is anyway? For three days this week, my emails simply disappeared. Who knows where they went in the meantime? Your guess is as good as mine. Perhaps they had a quick holiday in Cairns, Queensland, which is many thousands of miles north of here, just to soak up some warm rays and catch some surf? I trust they were careful of both the jellyfish and salt water crocodiles whilst they were off enjoying themselves? Eventually however, the problem was corrected – with a bit of technical assistance – and the emails all reluctantly worked their way back down south to the cool climate mountain range here. I hope they’re not disappointed with the winter weather here compared to up north? That wasn’t the biggest mystery I had to deal with this week though. 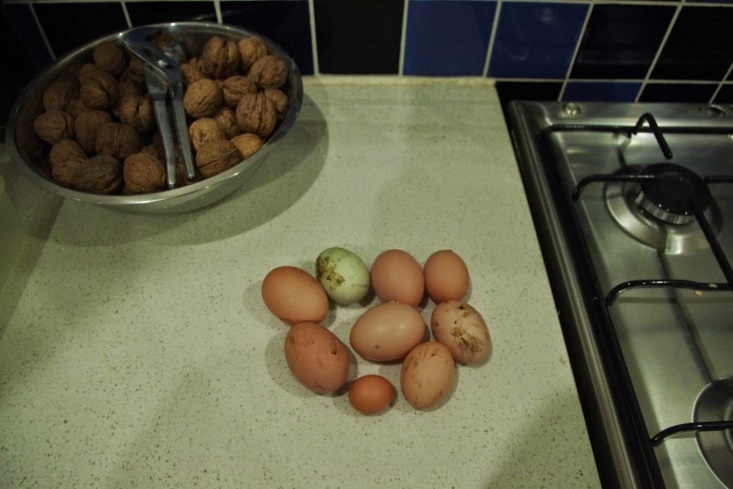 As the daylight hours lengthen at the farm here following the winter solstice (June 21st here), the chickens start to produce eggs again. 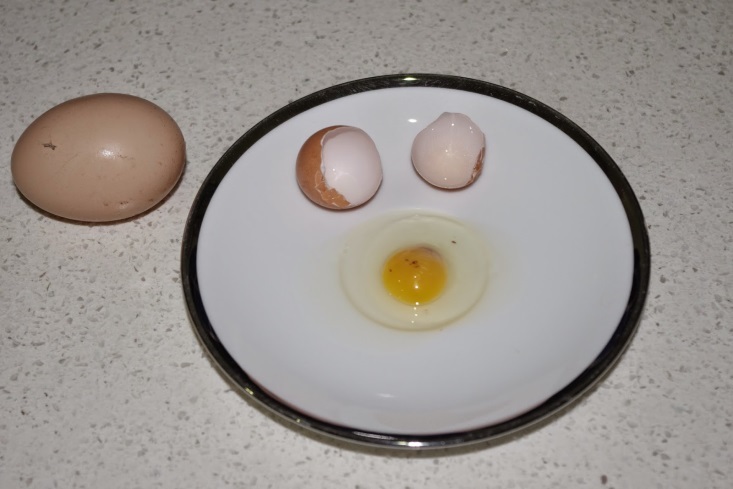 Sometimes, the first egg of the season has a slightly soft shell and when you pick it up you accidentally put your finger through that egg shell and the contents spill everywhere. On the other hand this is great news for the dogs as they love eating eggs and any excuse will do for them. However, I have never before seen such an undersized egg before. The life cycle of a chicken at the farm here involves moulting (losing) some of their feathers during the heat of summer. Chickens feathers are the equivalent of a human wearing a thick woolly jumper, so on a hot summers day where the temperature is in excess of 40 degrees Celsius (104F) recorded in the shade, the chickens have to moult feathers so as to lower their body temperatures. Eventually, the autumn weather arrives, the air temperature cools down, the daylight hours shorten and the chickens decide to regrow their feathers. Unfortunately for humans, chickens can’t regrow feathers and lay eggs at the same time. Therefore, egg production declines and almost ceases during the late autumn to early winter. It is interesting to note that commercial producers of eggs get around this natural life cycle by leaving the chickens under artificial lights, often in an enclosed barn. The chickens in those conditions possibly don’t have a clue as to what is going on and continually lay eggs. However, this process also strips the birds of calcium and they live a short life of often less than two years. In comparison some of the chickens here are four years old and they still lay very well. The exception to the above natural life cycle of chickens moulting during summer are: silkie chickens, as they seem to operate on a completely different life cycle altogether. A silkie chicken will lay about 80 eggs per year, but because they do not appear to moult during summer, they lay eggs during the cooler months of autumn and winter. The other advantage of silkie chickens is that they generally have very pleasant personalities and are quite happy to act maternally to many of the other chickens here. Unusually, silkie chickens are not even at the bottom of the pecking order as they appear to have a no-nonsense attitude with the rest of the chickens. On the negative side, Silkie chickens don’t produce a lot of eggs during a year. However, fresh eggs when there are no other eggs is alright by me. 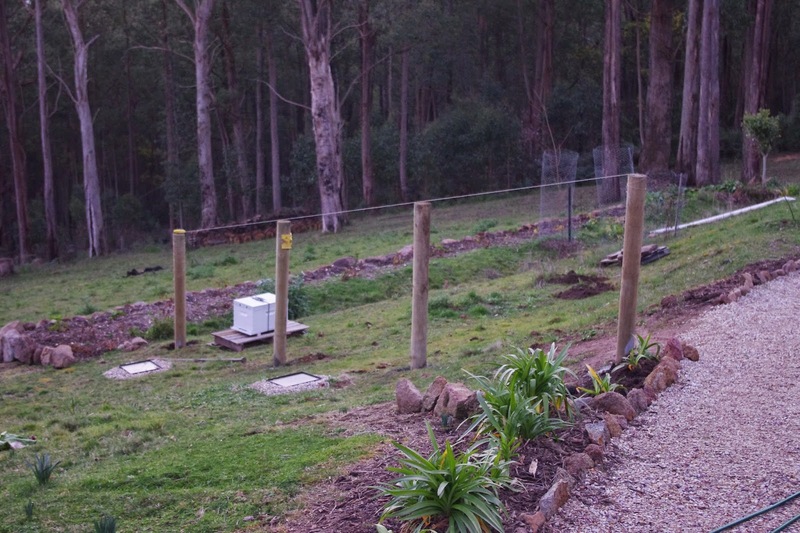 In other farm news, the blackberry enclosure received a few more posts this week. 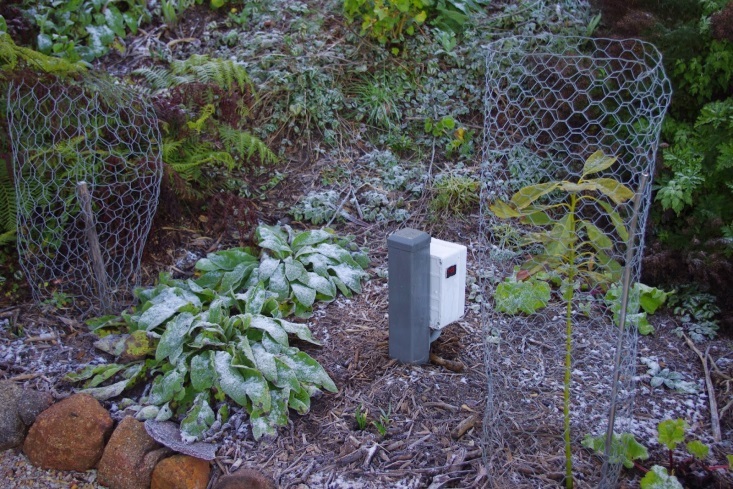 I also installed the metal gate for the blackberry enclosure on the corner post. This metal gate was originally a security door which I purchased second hand from some dude in Melbourne. The security door had a bronze perforated sheet (mesh) which was used to make an excellent bushfire screen over one of the windows on the shed here. However, I was left with this heavy duty steel security door frame which I didn’t have a clue what to do with. With a little bit of imagination, the security door frame has this week been cut smaller so that it is a useful gate for the blackberry enclosure. During the week, I also welded a latch onto that steel gate frame. 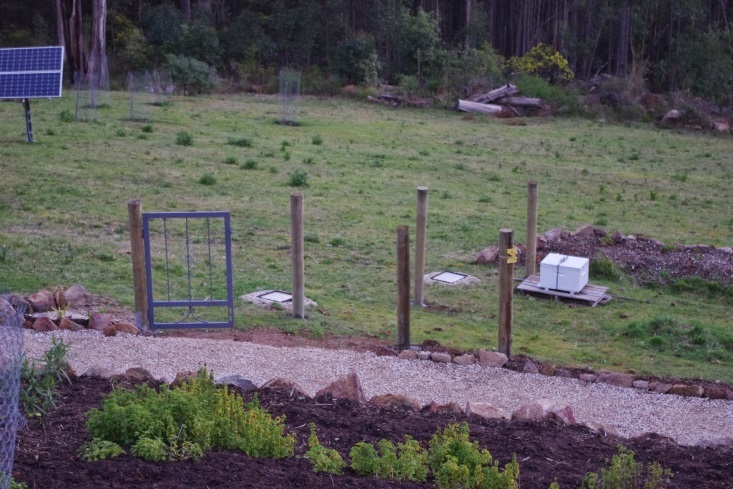 However, nothing is ever simple and after I attached the steel gate to the timber post for the new blackberry enclosure, I realised that the entrance wouldn’t be wide enough so as to able to easily move the wheelbarrow into the blackberry enclosure. This was because the corner angle was less than 90 degrees. It was slightly drier this week at the farm, so the excavations for the new water tank site continued. Actually it was good to take a break from the excavations over the past few weeks as the plans for this area have morphed into something very exciting! The change in plans, are the result of a few good ideas thrown around over the weekend. The ideas were not obvious even the week before. 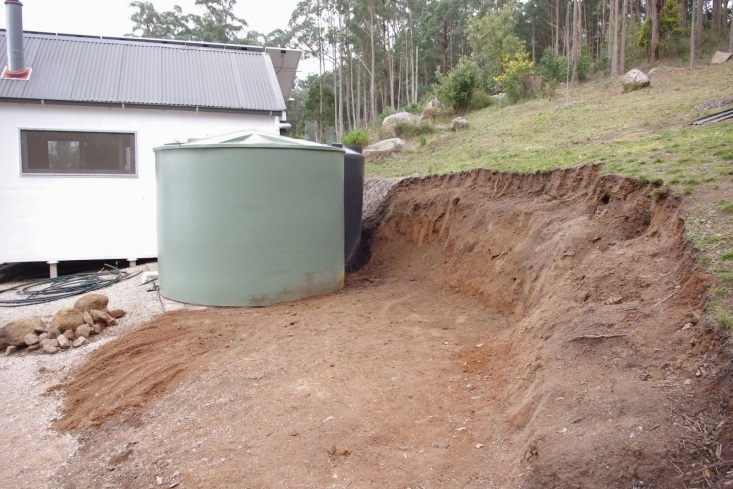 Hopefully a new water tank should appear here over the next week or two before the winter rains start to die back (there is a bit of a lead time between the act of ordering the water tank to the delivery of the tank to the shop). I went a bit crazy with the video camera here this week and produced two videos! What’s going on? The farm is in a thick cloud right now and it has been raining for most of the afternoon. The temperature outside here at about 8pm is 6.0 degrees Celsius (42.8 F) and so far this year there has been 542.2mm (21.3 inches) of rainfall which is up from last week’s total of 534mm (21.0 inches). So, it is hardly a surprise when it snowed here again this morning. The snow didn’t settle on the ground, but it did put on a good show whilst it was here. Within half an hour it was merely a memory though. Dude, let me in NOW! As a fun fact, eucalyptus leaves contain quantities of volatile oils. Those volatile oils can be extracted and as a bonus they are widely used in Australia as both a household cleaner and a disinfectant. Tidy work! 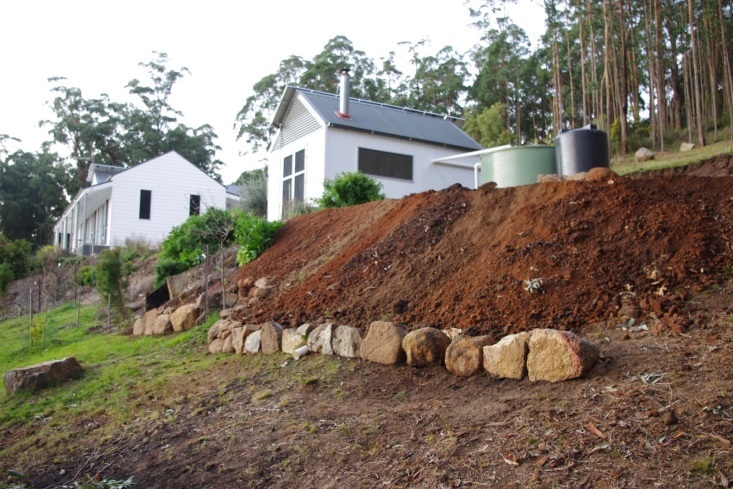 The downside to this volatile oil is that the eucalyptus leaves are effective against both bacteria and fungi in the top soil as well as in the household. This is a bad thing because it is those bacteria and fungi which convert organic matter (i.e. the leaves and sticks) into productive top soil. So the leaves can sit on the ground for a few years, happily drying and providing fuel for any forest fires which may pass. The combination of poor top soil and high acidity results in an environment where other plant species have difficulty competing with the eucalyptus trees. This can be seen in the clearly defined line between the forest and the orchard. 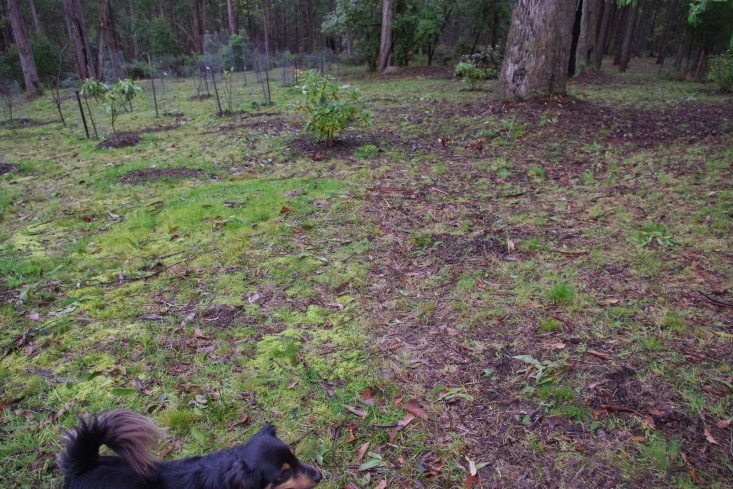 Right in the middle, straddling both ecosystems is a happy Rhododendron that will probably flower over the next month or so. Rhododendrons love acidic soil and they and their Azalea buddies are always a reliable indicator that the soil in that particular location is acidic. There are many examples of these plants up in this mountain range both in gardens and also in the forest which are well over 100 years old. The orchard on the other hand has grasses and mosses and they are flourishing as these plants prefer soils with a more neutral ph. 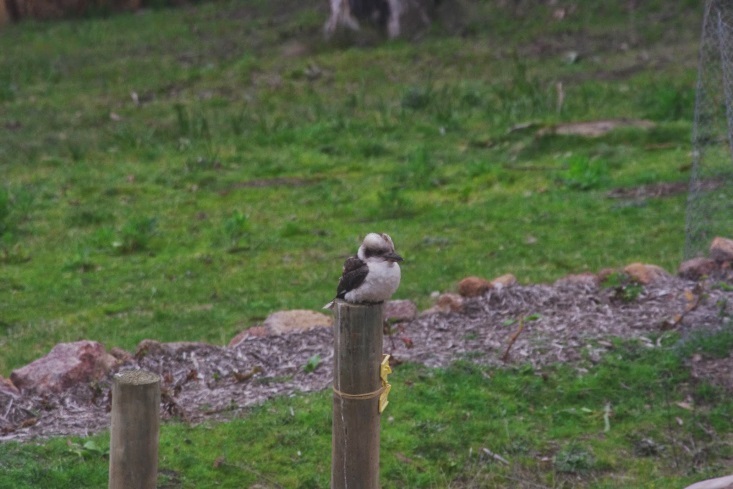 As another interesting observation, it is the grasses, mosses and herbage which all of the native animals come to eat at the farm here. Which gets us right back to the task of burning off the leaves and small branches over the past few days. The wood ash produced by these small fires has a basic ph. The wood ash can be collected and sprinkled over acidic soils and it will raise (Thanks Rich!) the ph. 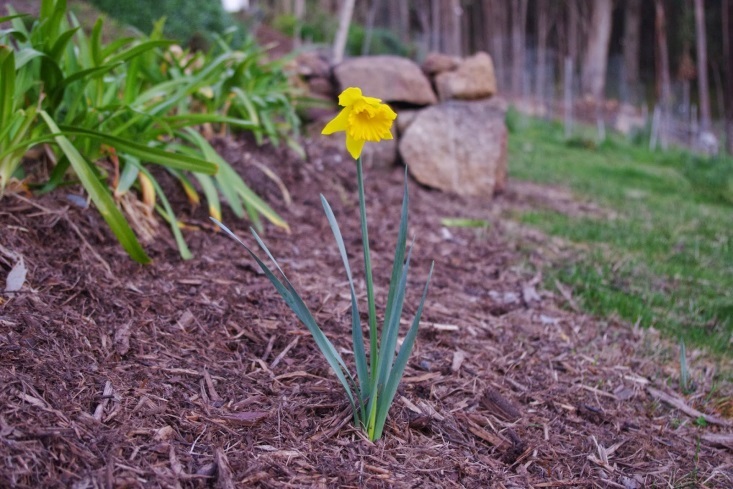 of those soils, provide minerals and produce lush growth and healthy top soil. I recently read an historical account of the Aboriginal land management practices on this continent. It did not surprise me that according to those accounts, every square metre (square yard) of the continent was subjected to small scale burn offs on a maximum of 15 year cycles. Food producing areas were subjected to that treatment on a 2 to 3 year cycle. It was a truly remarkable undertaking and one that I’d judge is well beyond our culture. Anyway, enough soil geek talk. As an interesting note, my editor in chief is not here today and has left me alone with the computer. haha! I have an unfortunate habit of banging on about all things soil and probably need to be reined in a bit, but that clearly isn’t possible today! 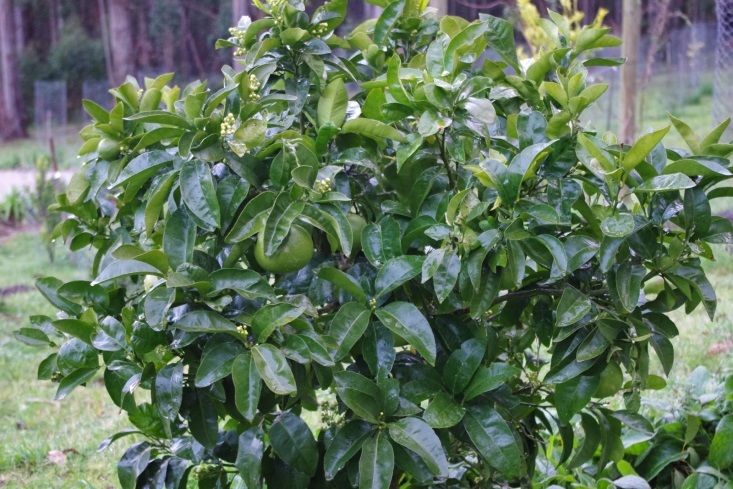 The citrus trees have all survived the frosts and snow over the past few weeks and are producing prolifically. By Christmas there will be lemonade and pomelo fruit too. 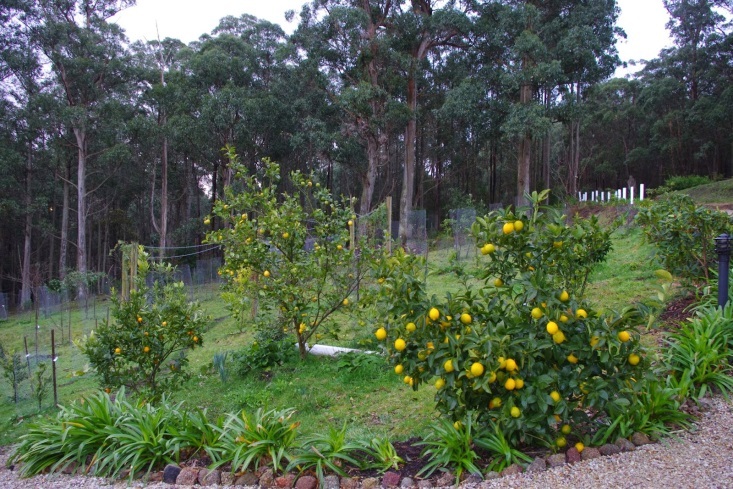 Unfortunately, the wallaby ate the mandarins, oranges and grapefruit a year or so ago and all of those fruit trees which should be producing fruit by now are instead slowly recovering. It is difficult to know what to do with a large quantity of lemons. One of my favourite uses for lemons is to make limoncello which is an Italian liqueur. Yesterday I made a batch of the liqueur which used the lemon zest (finely grated lemon skin) of about 20 lemons. This liqueur will become a handy Christmas present. 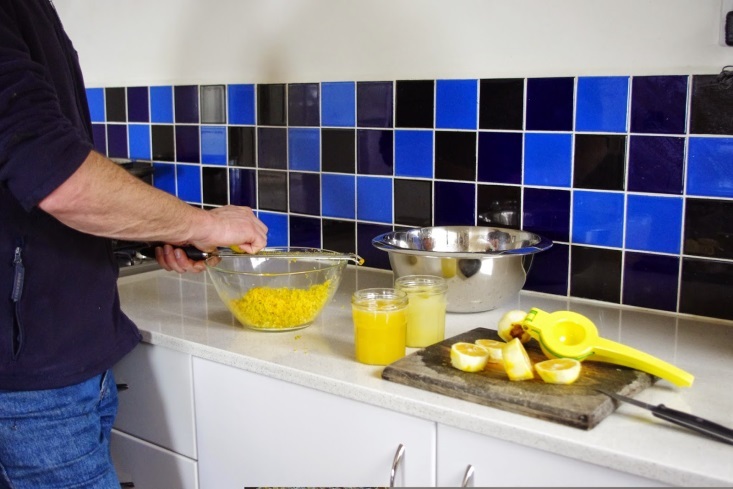 The lemon pulp is not wasted because it is squeezed and the lemon juice is then frozen and used in cooking when needed. 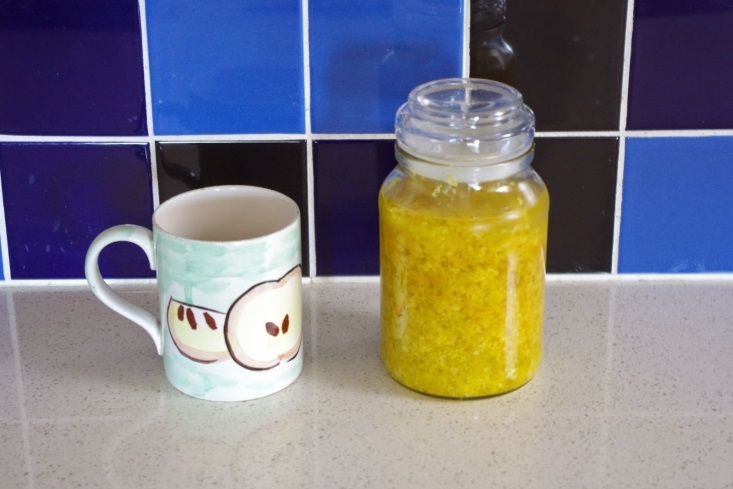 If you look at the photo carefully you’ll notice that the two jars of lemon juice are slightly different colours. The jar at the front contains the juice of the meyer lemon tree and I believe that tree is a lemon and orange cross as it has a pleasant taste. The rear jar is much lighter in colour and it contains the juice from a eureka lemon fruit tree which has a strong lemon taste that will knock your socks off! Last spring a self-seeded cherry tomato plant produced an excellent tasting tomato fruit that ripened one full month earlier than every other tomato plant. 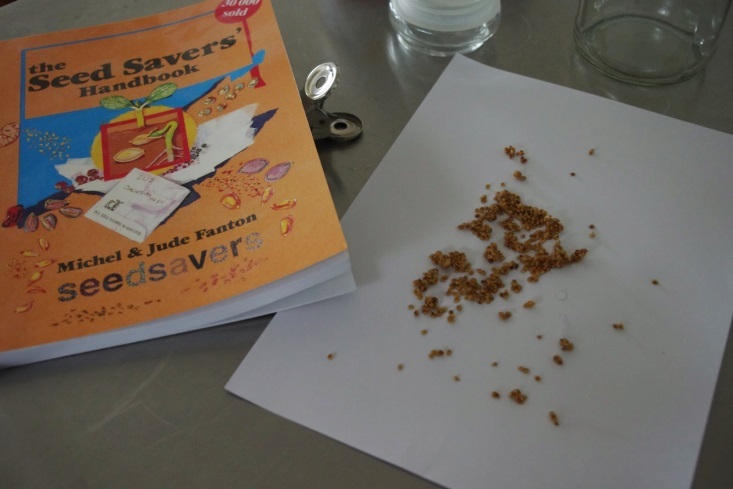 In June, I saved the seeds from that particular plant and will hopefully see whether the seeds can then reproduce the success of the original plant. I’m currently drying the seeds after having fermented them for a few days in a small jar. It is raining outside right now and I’m grateful to be collecting some of that rainwater for later use during summer. 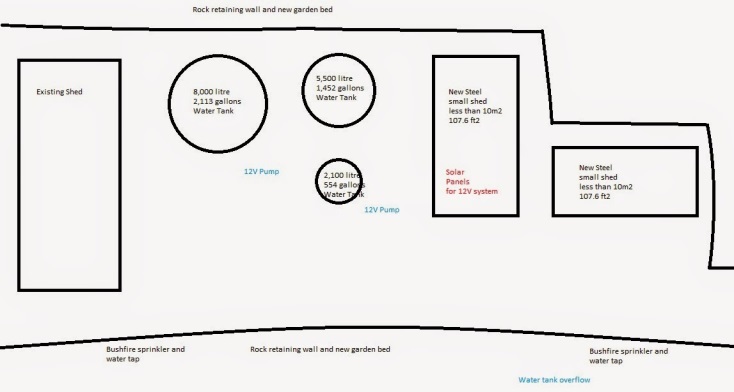 A couple of weeks back I produced a short YouTube video showing the water catchment system for the chicken enclosure. I collect and store rainwater from every roof here at the farm and the shed is no exception. Yesterday, I put together another short YouTube video showing how the shed water collection system works. 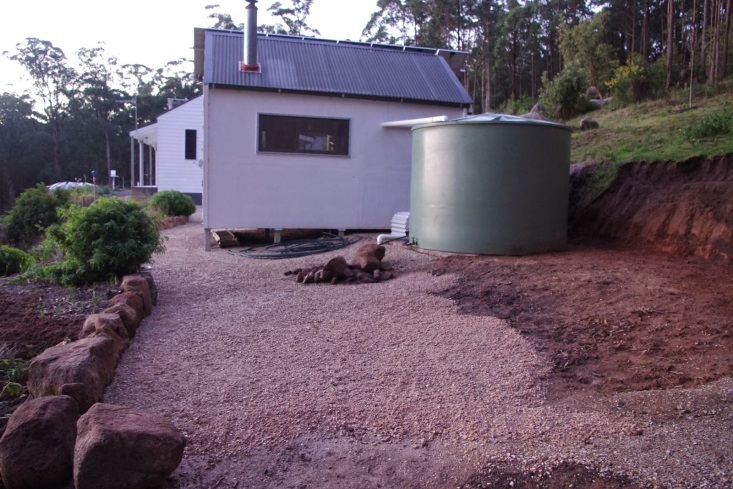 This water system on the shed is different from the chicken enclosure because it is much bigger, includes several taps, a pump and even a bushfire sprinkler. For those that take the time to watch the short video, I can report that the video camera still works despite my best efforts to destroy it with the bushfire sprinkler! In breaking chicken news, I’m now receiving 4 eggs per day and Frizz the chicken has made an unexpected full recovery from her sore leg which last week was sticking out at a strange angle from her body. Of note this past week too, is that the house batteries have been 100% full at some point in the afternoon on most days. This has been the first week that this has occurred since the winter solstice here on the 21st June. 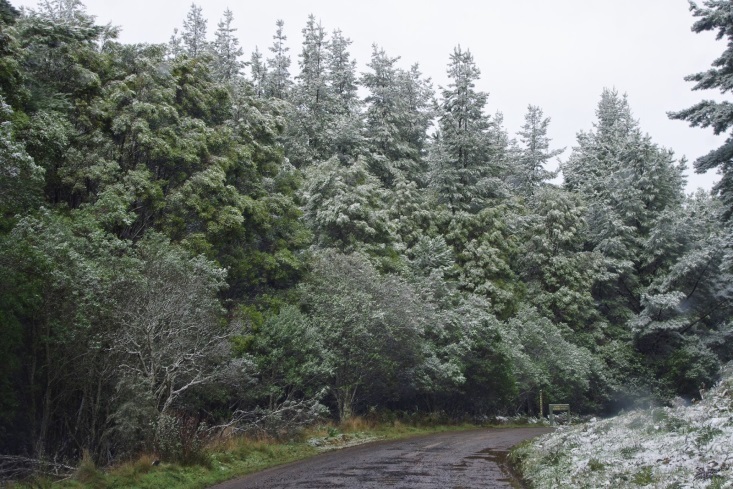 The temperature outside here at about midday is 3.5 degrees Celsius (38.3 F) and so far this year there has been 534mm (21.0 inches) of rainfall which is up from last week’s total of 531.2mm (20.9 inches). It has been an interesting week weather-wise here. It is rarely windy or frosty here, but this week has proven those concepts to be completely wrong. The wind howled for most of the week. The bushfire shutters were installed over the windows at one stage because the windows started making strange sounds due to the extreme wind pressure. The glass in the windows is double glazed toughened glass too. Then Friday, it became eerily still and then suddenly it began to snow. The snow didn’t settle on the ground here at the farm, but it just kept falling from the sky. So I did what any proper Aussie would do faced with those circumstances and said: “stuff work, let’s go up and check out the snow”. The forest here for some strange reason has established stands of exotic trees and in the photo you can see a stand of Douglas Fir trees to the right and the local native Blackwood’s (Acacia melanoxylon) to the left. Underneath both are the native Victorian Christmas bushes which flower at around Christmas time. Just to add to the general weather weirdness, it just didn’t warm up in the shade at the farm here over the following few days, despite mostly sunny days. 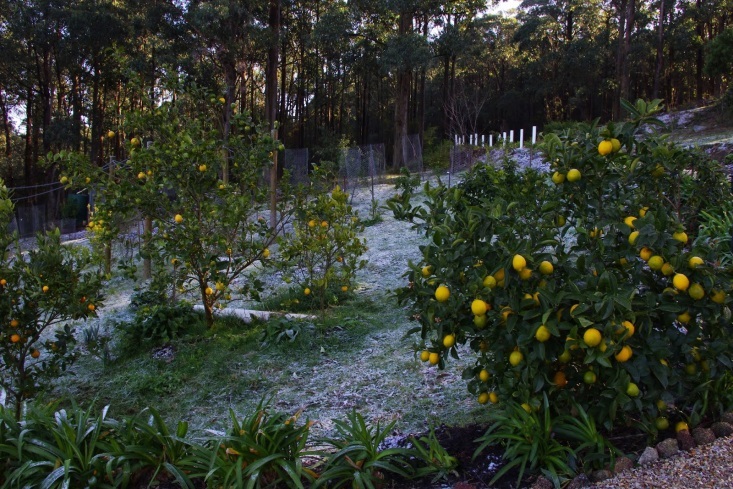 The ground underneath the citrus trees and outside of their drip-line, is still frozen on Monday night. It is sort of weird because the soil is crunchy when you walk upon it. I never intended to live in frozen tundra! 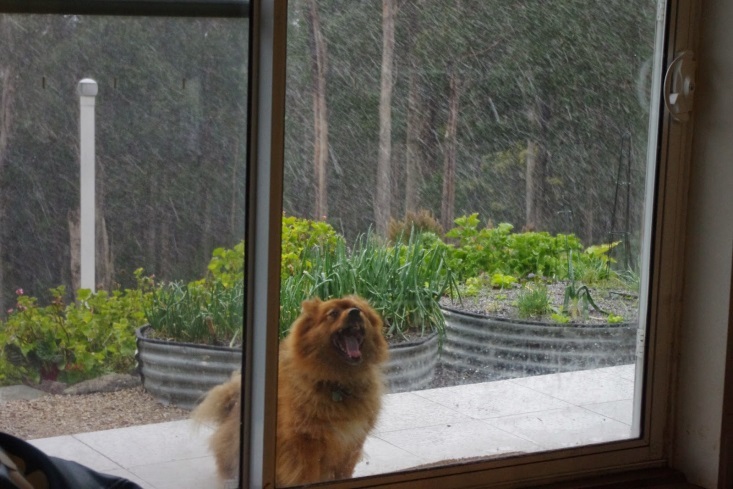 Even the dogs are a bit freaked out by the frost and snow. The only plant here so far that has died has been the coffee shrub, which is a shame as it looked quite healthy prior to the snow and frost. Conditions haven’t been good enough to continue with the excavations for the new water tank site, so a few days ago, I extended the rock walls both above and below the excavation site. Some of those rocks weigh more than I do and it was fortunate that all that was required to get them into position was to dislodge them and then roll them down the hill into their new location. I’m actually starting to seriously run short of rocks here. 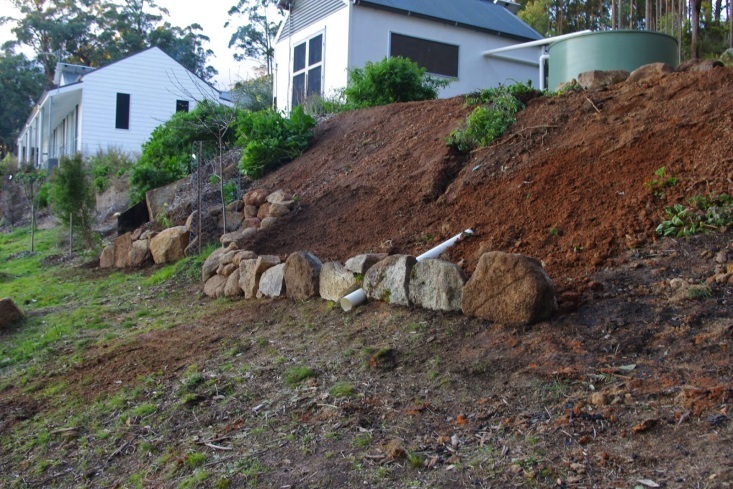 The rock walls are valuable as they provide a solid barrier for water which may run and take soil with it during heavy rain. You can see in the photo below that the recent rains have gouged a channel through the soil that I’ve dumped into its new location from the excavations. Due to the very wet weather too, I’ve built up a walkway across the excavation site. The stone is a flint based material which includes a healthy dose of lime. This is important because with a little bit of water and sunshine, the stone and lime material sets hard like rock and provides an all-weather surface. It hasn’t all been about winter weather here though. I’m planning ahead for the summer too. This week, I’ve installed the stainless steel security door which covers the new glass front door which was also installed recently. The steel security door reduces the heat load on the toughened glass in the front door should a bushfire ever pass through this area. It is very hard for me to forget that during the Kilmore East fire which roared through the Kinglake area (which has very similar forest ecology to here) during February 2009, that in some motor vehicles, the alloy engine blocks melted. This requires a temperature in excess of 600 degrees Celsius (1,112F) so I am under no allusions on this subject. 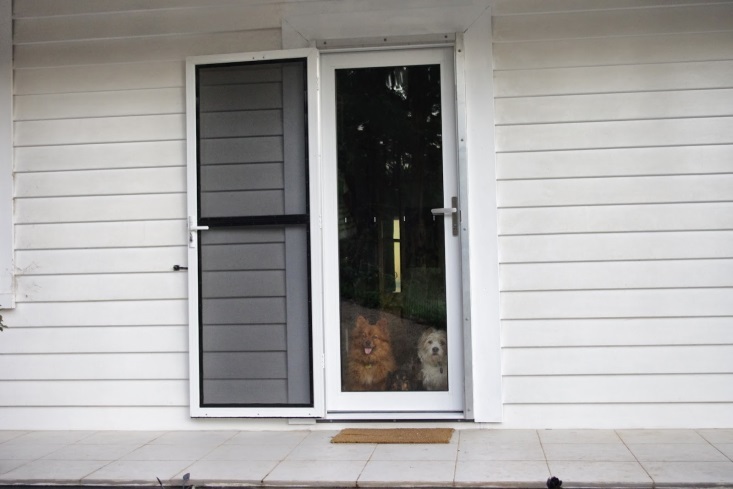 The only problem with a glass and aluminium door, is that the dogs can look through the glass to see what is going on outside. I’d describe that as an undocumented feature! The blackberry enclosure now also has a few extra posts and the photo below shows how I line up the posts and get those posts vertical. 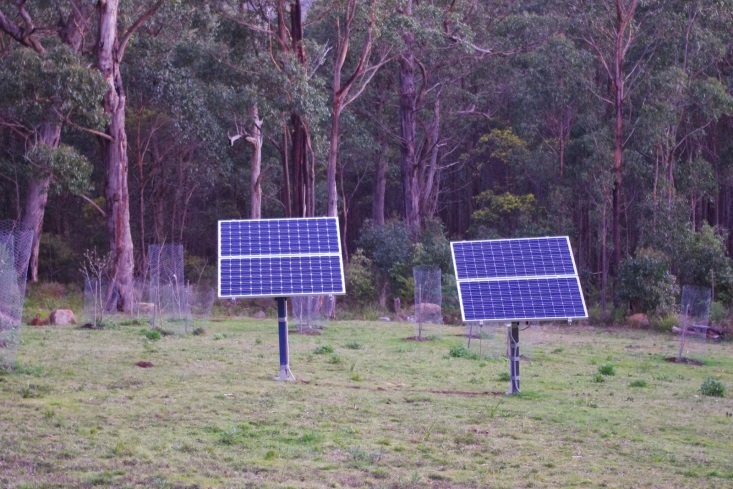 The two new solar panels that were installed on the free standing mounting were also aligned so that they matched the existing solar panels. 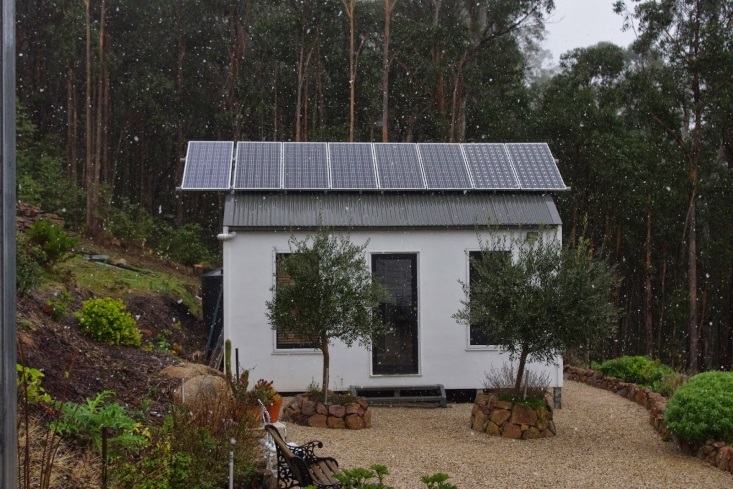 I looked at them after the initial installation and thought that they looked a bit askew, so had a great idea about spending 15 minutes lining them up with the existing solar panels. Three hours later the job was done. Who’d have thought that something so simple could become such a complex job! It has been a busy week! 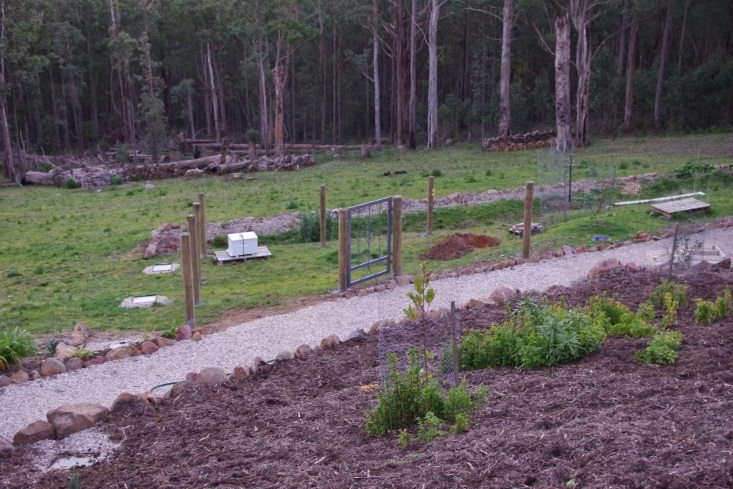 The lower garden beds have now been fully mulched. 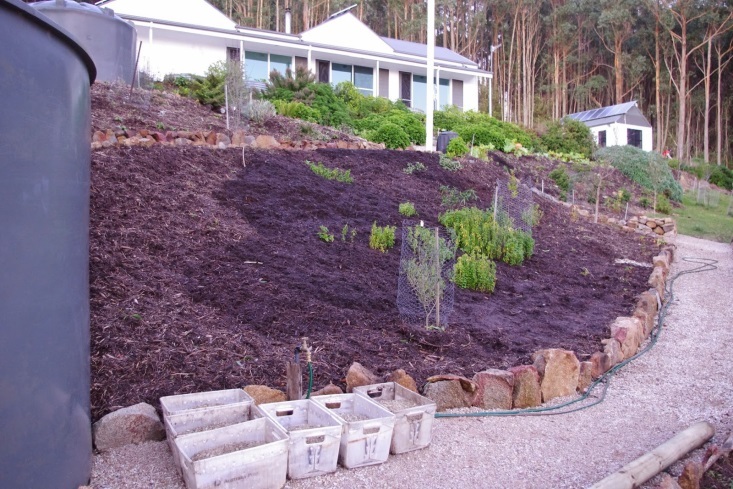 I’ve been adding a mix of mushroom compost and composted woody mulch onto that bed. I’ll start planting the bed out with plant cuttings over the next few weeks. Sometimes though at a farm you need to know when to ask for help. With the heavy winds over the past week, a few large trees have toppled over and/or broken. Today, I hired some guys that I know to help clear up all of the storm damaged trees, so I’ve been on the end of a chainsaw all day as well. It is really important to clear up those fallen and broken trees because although they don’t present a fire hazard today, by the time summer comes around they’ll be nice and dry and will provide a substantial amount of fuel for any bushfire that happens to pass through this farm. Eucalyptus leaves have a very high oil content and a very low mineral content and it may be interesting for some people to see just how green eucalyptus leaves burn during the middle of what has been a reasonably moist winter. 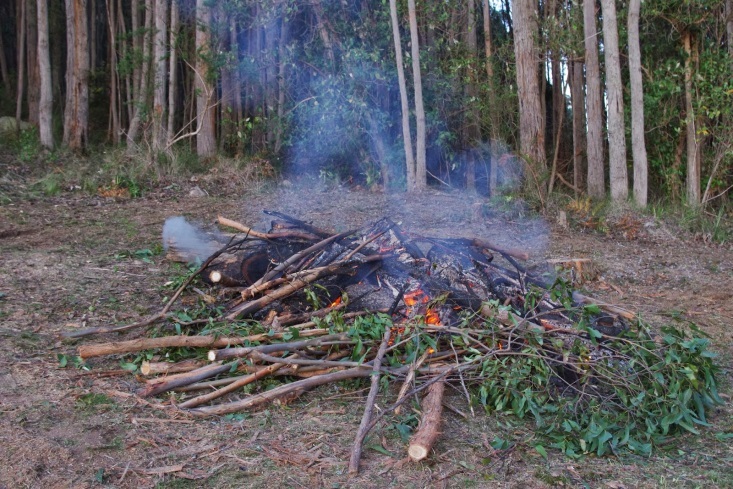 Only the leaves and small branches are burnt with the remainder being retained for firewood. In breaking chicken news, I’m now regularly receiving 3 to 4 eggs per day from the 14 chickens here. The sad thing is that the ultra-violent chicken “Frizz” took a tumble over the past few days and has injured her leg. Frizz who can honestly only be described as the honorary rooster here in the chook collective is a Frizzle feathered variety of the locally renowned Isa Brown chicken variety. 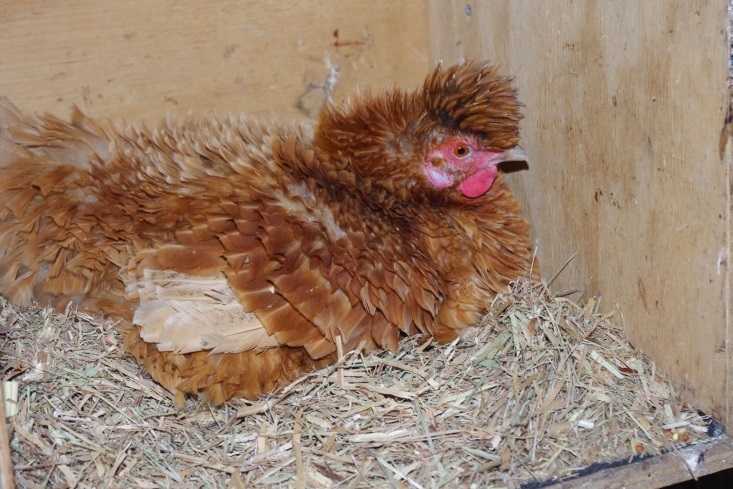 My lady spotted her with a companion at a local poultry sale a few years back and felt sorry for her because they were in a very small cage and Frizz was pecking her mate. Upon reflection of the decision to purchase Frizz and her mate: soft hearts make poor decisions; and pecking chickens are just mean pieces of work looking for an easy protein hit. Surprisingly enough even though Frizz has the muscle to be the boss chicken, she lacks the personality. Rumpole the Araucana and her mate Liz the enforcer (who is also an Araucana) are the bosses of the chicken collective here and they rule the roost with an iron claw. Still, it does look like Frizz seems to be recovering slowly. Frizz the contender may just bounce back? The temperature outside here at about 9pm is 2.9 degrees Celsius (37.2 F) and so far this year there has been 531.2mm (20.9 inches) of rainfall which is up from last week’s total of 505.4mm (19.8 inches). 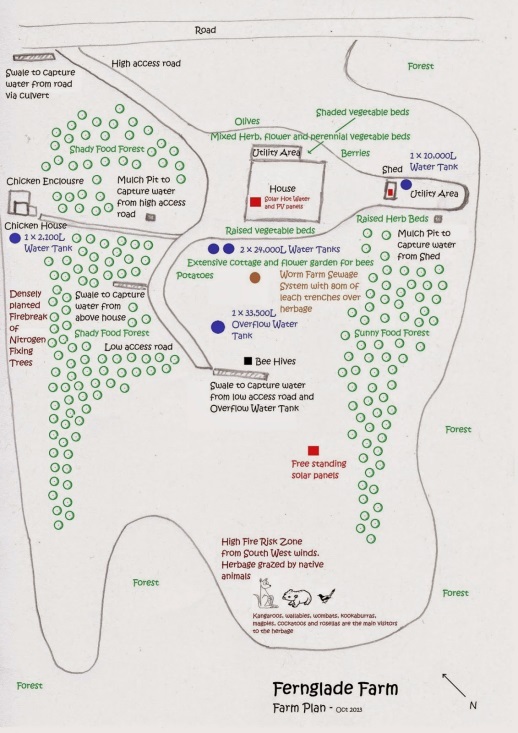 Below is a map of the farm, so that you can start putting some of the systems into context and location.